NEW! "A NOANK SAMPLER" DVDs are available for $20 each or $50 for three! COME IN, CALL, OR EMAIL TO BUY! EMMA C. BERRY, a Noank well smack, was built in Noank in 1866. Originally rigged as a sloop, she went to New London in 1884 where she was converted to a transport schooner, and was there until she went to Maine in 1889. She returned to Noank in 1966, for a big celebration at the Shipyard site to welcome her home before she went on her way to be part of the Watercraft Collection at Mystic Seaport Museum. 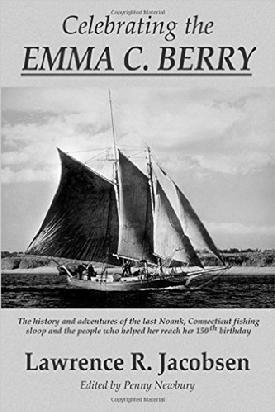 Celebrating the EMMA C. BERRY: The history and adventures of the last Noank, CT fishing sloop and the people who helped her reach her 150th birthday, is the legacy book by Larry Jacobsen. It is available through amazon.com for $15 plus shipping by clicking on the above image, also in person at Noank Historical Society and the store at Mystic Seaport Museum. WINNER OF A CONNECTICUT LEAGUE OF HISTORY ORGANIZATIONS 2016 AWARD OF MERIT! CLICK ON THE ABOVE IMAGE TO ORDER! 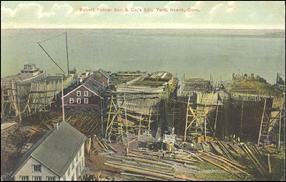 The Palmer Ship Yard, the largest builder of wooden vessels on the Atlantic Coast, built over 600 ships, boats, rail car floats, tugs and yachts, in the late 1800's. SS RHODE ISLAND, a large wooden side-wheel steamboat with elegant accommodations of 165 staterooms and 126 berths, was built in 1882, by R. Palmer & Sons of Noank, one of the most prominent shipyards on the American east coast. She sailed in the service of the Providence & Stonington line, from Stonington to New York, and could carry 1,600 passengers, with a crew of 121. The Society has two buildings: the Sylvan Street Museum, which houses its archives, library, and exhibits, and the Latham Chester Store, which is the venue for the Society's various social programs, meetings, lectures, and member art exhibitions. The Sylvan Street Museum draws visitors and researchers interested in Noank people, houses, schools, Palmer Shipyard, boatbuilding, fishing and the artists’ community. People often are researching for family genealogical information to learn more about their Noank connections. 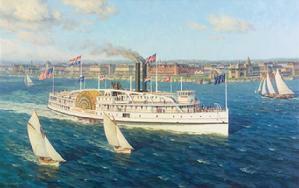 Its archives are a great source for the study and enjoyment of New England shore history. Visitors learn of the Museum through the Noank Historical Society’s various social programs, such as quarterly meetings and lectures, quarterly newsletters, and through references from other historical and tourist organizations. Noank is on the Register of Historic Places. 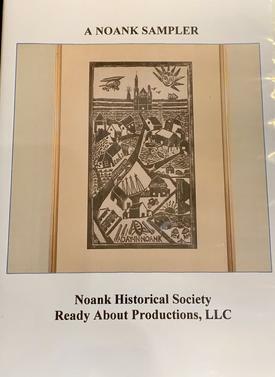 The Noank Historical Society was founded in 1966 as a nonprofit corporation by Noankers interested in preservation of Noank history and artifacts. The Society is supported primarily by its members through donations in the form of dues, donations, and time. We hope you will join us. We celebrated our 50th anniversary in 2016!